Training for Human Rights Defenders on Protection. The twin challenges of global poverty and violent conflict require us to understand how the tasks of peacebuilding and development can work together to enable communities, countries and regions to improve people�s lives. TRaining For Women Rights Defenders or Human Rights NGOs. The legal fellowships programme Apply Now!! SAWF is pleased to announce the launch of its Legal Fellowship Programme. The call is open to women lawyers, women human rights defenders with para-legal training working in small towns at the primary/lower court level in Bangladesh, Nepal, India, Pakistan and Sri Lanka and have at least two year's experience of working on women's rights issues through a feminist legal praxis. The last date for receiving applications is 31st January 2013. Please note that SAWF will receive applications in English, Hindi, Urdu, Bengali, Tamil, Nepali and Sinhala. 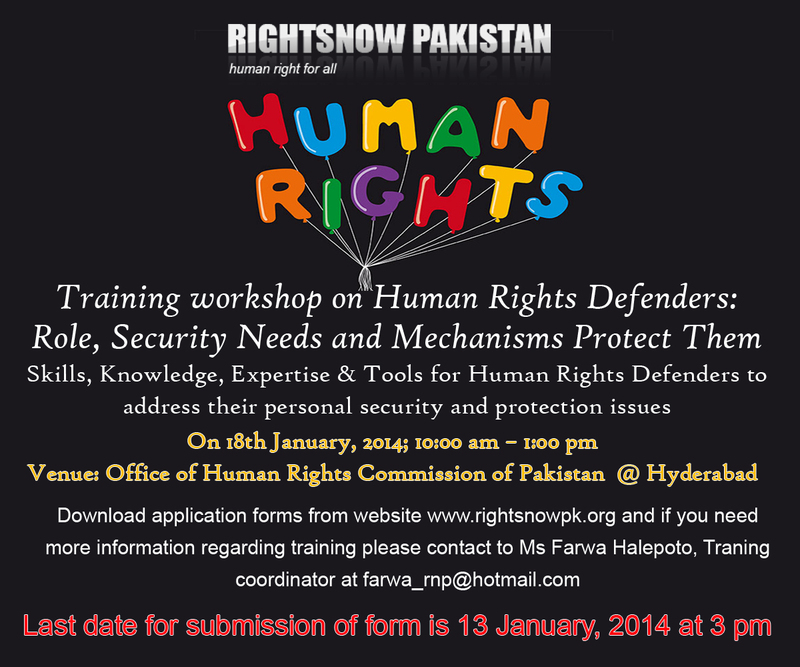 One day training workshop on "HUMAN RIGHTS, DEMOCRACY AND YOUTH MOBILIZATION" on 12th January 2013 at RightsNow Pakistan office Hyderabad. RightsNow Pakistan is a local civil society initiative, governed by a vibrant Board of Directors consists of renowned human rights lawyers, journalists, development activist and other civil society actors, who are striving for the positive change in the society and are concerned about the current situation of human rights and human security. The purpose of establishing RightsNow Pakistan is to establish an educated, just, well informed society that respects dissent, human rights and act rationally and nonviolently. Currently the situation of human rights in Pakistan is abysmally alarming. 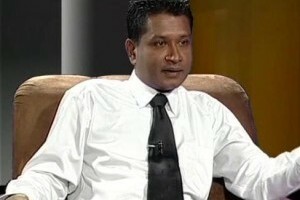 Security situation for lawyers, journalists and ordinary citizens is deteriorating. Since 2001, more than 35 journalists have lost lives in Pakistan. 12 Lawyers have been killed recent Karachi violence. Thousands of innocent and peace loving Pakistanis have lost their lives in different violent incidents across the country. For improving the level of security and human rights situation in Pakistan, RightsNow Pakistan believes that sincere and dedicated efforts need to be taken by the citizens and civil society to support the willing State to reduce the violence and protect human rights. Elimination of violence and improvement in human rights is possible only by building the capacity of State institutions, individuals and civil society actors who use tested nonviolent strategies. Education of people on basic humane values like nonviolence, tolerance, pluralism, respect for dissent and human rights is necessary. Promotion of citizen journalism is an area or tool which people of Pakistan can use for the monitoring, documentation of human rights and achievement of fair and speedy just. Once people are educated and sensitized on human and equal rights, immense respect for people’s rights, space for democratic dialogue will be created and accommodation for dissent will be promoted. RightsNow Pakistan and Sindh Progressive Lawyers Forum condemn violent Act by the Punjab police. RightsNow Pakistan condemns the killing of Handri Masih, Member of Balouchistan Assembly. The call for a two-day PEN DOWN strike across the province was given by the All Sindh Subordinate Judicial Staff Welfare Organization for pay rise. It started on Friday, 6th January 2012 and continued for the second consecutive day, Saturday 7th January, 2012. It mustered support from the civil society, the Sindh Bar Council, Karachi, Hyderabad, and other Bar Associations. Long Arm of the Law………Use it for the protection of animals, birds, trees and environment! Advocate Kanji Mal Meghwar from RightsNow Pakistan files Petition at Session Court Mithi Against Illegal Transportation of Peacock! Today District Bar Mirpurkhas has condemned the young lawyers’ abduction and called for his immediate release. RightsNow Pakistan condemns this dirty act and is concerned about worrying trend of abduction of minorities for ransom and other reasons compelling them to leave the province and the country. Such incidents are being reported from different parts of Pakistan on regular basis and have increased in recent past. or two years in a row, Pakistan has been hit by heavy rains and severe flooding. According to one figure, total estimated number of people affected last year was over 29 million and total number of houses damaged were over 3.2 million. It is saddening to know that native people of Sindh and Pakistan are leaving the country for security reasons. Every day four to five Hindu families are leaving the land of their four fathers due to threats to their lives, families, and business. Recently media reported the departure of five Hindu families who migrated to India over security concerns. These five families comprised total thirty seven people who are feeling more disgruntled.1These Hindus who chose to stay in Pakistan after partition and believed Pakistan their real homeland. They have been facing threats of abductions for ransom, killings for not paying ‘bhattas’ and forced conversion.